Shown to the public for the first time on March 25, 2017 at Baselworld, “The Grand Phoenix” as it was introduced by Ravi Lunia, the international director of the company, is a truly unique piece. Going for a princely sum more than most mansions throughout the world, The Grand Phoenix is also a show-piece that isn’t likely to get much day-to-day wear. Faidee is a company known for high-quality jewelry that exceeds the expectations and standards of the general market. With their newest creation, they may have exceeded even their own incredibly high standards. Faidee has produced some truly astounding pieces in the past before, so when Lunia unveiled The Grand Phoenix, many people were holding their breath in anticipation. What came was a surprise to even the most jaded fine jewelry connoisseurs and jewelry business experts. A regal necklace made up of 24 top-quality Pigeon’s Blood rubies, commonly known as unheated Burmese rubies because of their color, make up the most striking part of the design. Coming in at a whopping 59.83 carats of these rubies, with individual rubies anywhere from one-carat to six-carats, these beautifully colored and rare stones steal the show from the outset. Paired with 100.21 carats of colorless fancy shape diamonds with a D color grade and given an FL or IF for clarity, The Grand Phoenix is truly a statement piece for the ages. 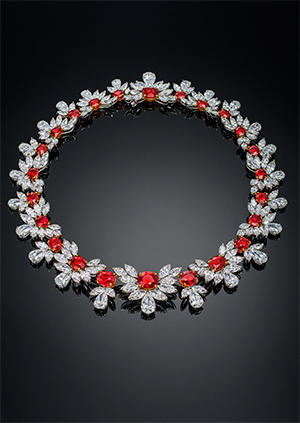 Valued at $35 million, the piece is also one of impressive stature in the world of fine jewelry. Before you can truly appreciate what Lunia and Faidee are doing in the world of fine jewelry, you have to go back in time to understand the importance of the unheated Burmese rubies and how truly rare they are. In the past, these stones were so rare that they were only common among royalty and the wealthiest land owners of the day. Today, Burmese rubies are still rare and high-quality versions are difficult to come by. That is why unique pieces like The Grand Phoenix by Faidee can demand such high prices on the international jewelry market. In general, the very best quality unheated Burmese rubies can demand nearly $1-million US per-carat, making some of the most expensive jewels the world has ever seen. Faidee is a company with a long family legacy and passion for these unique Burmese rubies. Built by Roop Chand Lunia in the 20th Century, a man who was often known as “the king of Burmese rubies,” the legendary Faidee company deals only in these unique and valuable stones. 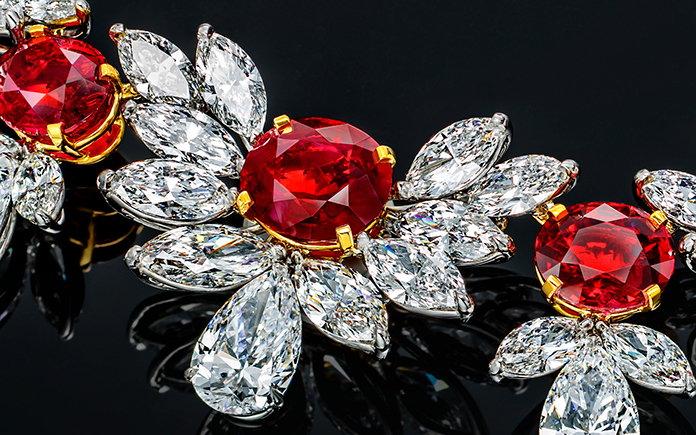 The passion for Burmese rubies is evident in even the history of the individuals who own the company. In past auctions, items from Faidee’s private collection have sold for more than $10,000 US at Christie’s and Sotheby’s. 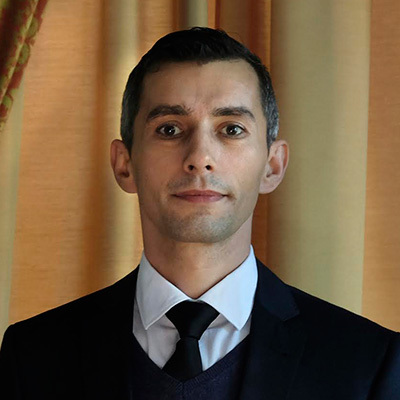 Along with the unveiling of The Grand Phoenix as Baselworld, Ravi Lunia of Faidee also announced a particularly compelling show that will take place in Monaco. Presented by the Stardust Monte Carlo, a well-known, long-time luxury jeweler in the area, many of Faidee’s pieces will be on display for viewing. The pieces will be presented at the Hotel Hermitage in the Salon Belle Époque located in Monaco, Monte Carlo. The exhibition will run from August 1, 2017 to August 27, 2017, and The Grand Phoenix will be included in the show. While you may never be able to buy The Grand Phoenix, either because it doesn’t go up for sale or because the sale price might be just out of reach for you, you will have a chance to see this astounding work in person if you can make it to Monte Carlo this August.